There are right ways and wrong ways to read your Bible. 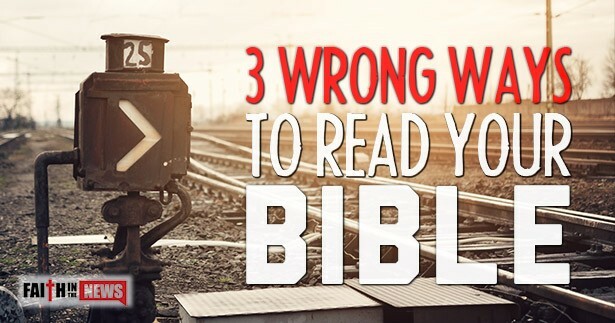 Below are three ways to not read your Bible. Maybe you can suggest another one and leave a comment. It is so easy to rip text out of context because if you take text out of context, it makes it a pretext and usually a false one. That’s how cults are formed. We need to take the whole context of the verse within the context of the paragraph within the context of the chapter and sometimes, as in the small Book of Jude, within the whole context of the book. I have heard and read of Christians who take one text and use it as a proof text and get into heated arguments over what they believe. This is typically pride-induced. They want to use the Word of God to prove they’re right, but what happens is Christians wield the Word of God like a sword and use it against other Christians. How this must grieve the heart of God. All Scripture is written for believers, but not all Scripture is written to believers. In other words, we can’t read about the animal sacrifices in Leviticus and try to apply these to believers today. These verses about the animal sacrifices were written to Israel (prescriptive) and not to the church, but they do point to Jesus’ coming sacrifice. These laws are prescriptive; that is, they are prescribed for Israel. For us, these laws are descriptive, and they describe how God sees sin and that sin requires blood and death. Paul wrote that he was crucified with Christ and is descriptive on what it means to no longer live in the flesh but to have Christ living within us (Gal 2:20). It is descriptive of the Christian walk, but we can’t read this and really believe that Paul was crucified with Christ on Calvary, can we? Here is a true story about a young man who wanted to know the will of God about something that he was considering. So he closed his eyes, opened the Bible, and put his finger on random verses. This is like trying to search the Scriptures and use the Bible as a Ouija board, but the problem is that this method can produce results that are anything but the will of God. By this method, one could close their eyes and put their finger on a verse. It might say “and Judas went out and hanged himself” (Matt 27:5), then “go and do likewise” (Luke 10:37), and finally “what you do, do quickly” (John 13:27). You can see the folly in such a Bible reading plan. As for me, I like to start in the Old Testament and go from Genesis to Malachi and also from the Gospel of Matthew to Revelation. In fact, every day I read some out of the Old Testament and some out of the New Testament, so I get a good overall look at God’s plan and His will for my life. That keeps the Scriptures in context (avoiding pretexts), and I know what’s descriptive (the parting of the Red Sea) and what’s prescriptive (Christ living within me). That way I don’t have to hunt and peck to know God’s will for my life.